Battery and Electric Vehicle - Marian, Inc. 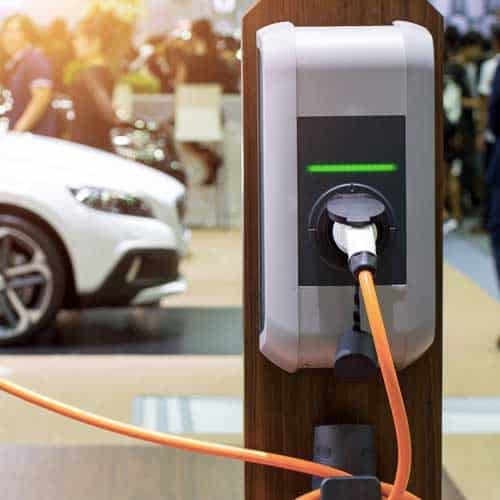 The rapid advances in the electrification of transportation are requiring engineers to incorporate advanced and innovative components into the designs for the battery as well as the charging infrastructure. Marian is a world leader in manufacturing components for both the automotive and electronics industries. With ISO 9001:2015 and IATF 16949:2016 certifications, Marian’s quality management systems are set up to meet the strict demands of the transportation industry. Marian can provide rapid turnaround on material samples and prototypes while also offering design assistance and collaboration. Contact Marian today to discuss your material needs for EV battery. 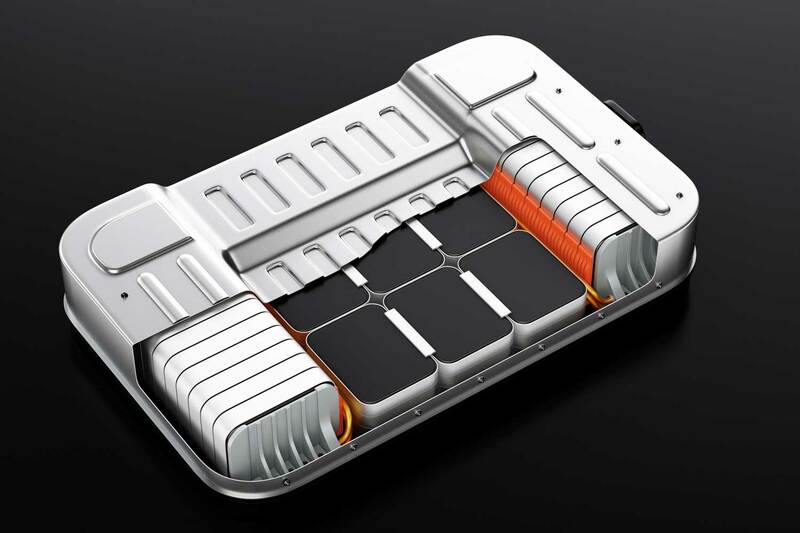 The battery cell, the basic energy producing unit of the EV battery, must endure shock transmitted during driving and withstand high and low temperatures. A stack of cells are assembled into a frame and contained into a module to protect contents from heat and vibration. The modules are assembled into a final package with various control/protection systems such as a battery management system (BMS) and a cooling device. Batteries produce heat when charged or discharged. This heat must be removed. Excess heat can reduce the battery’s performance and limit the life of the battery. Die-cut thermal interface components provide effective heat transfer within the battery cell, pack and module. Marian manufactures thermal gap pads, phase change, and graphite components to solve these issues and to increase battery life. Key thermal management material suppliers include 3M, Saint Gobain, Neograf and Polymer Science. Additionally, prevention and suppression of thermal runaway propagation within battery cells and modules ensures battery and EV safety. Marian converts a variety of flame resistant materials that meet specific UL requirements. Some materials include 3M™ Flame Barrier and Rogers® BISCO® Silicone Foams. Sealing of the battery module and battery pack is critical to its operation. EV battery modules and packs are often enclosed between upper and lower housings. Seals between these two housing elements protect sensitive components from water, dust and air ingress. Seals also assure any dangerous materials are contained in the event of a collision. Selected gasket and seal materials must withstand extreme temperatures and are often required to be UL94 V-0 rated, passing horizontal and/or vertical burn tests. Marian can be a great help in material selection. We maintain strong partnerships with leading raw material manufacturers such as Rogers Corporation, 3M, Zote Foam, and Armacell. Rogers BISCO® Silicone and PORON® Urethanes are excellent for EV battery gaskets and seals. These materials exhibit great compression set resistance while offering long-term proven performance at extreme temperatures. 3M™ VHB™ double coated foam tapes can also be used to join and bond materials while sealing out moisture and dirt. Dielectric barrier materials and flame barrier films are integrated into the battery components to meet rigorous electrical barrier and insulation requirements to keep the battery running safely. These materials often double as thermal barriers and insulators as well. Materials are lightweight, flame retardant, and easily converted to meet unique application requirements. Marian manufactures custom components from materials such as ITW Formex®, Lexan™ films, Kapton® Polyimide films, and 3M™ EMI/EMC materials. Compression pads and spacers within the battery module must be firm enough to hold the battery cells in place while also maintaining compression as the cell expands and contracts. They must also exhibit long-term performance at a range of extreme temperatures and conditions. Marian is a leading converter for many compression pad foam materials including Rogers PORON® polyurethane, Rogers BISCO® silicone and other neoprene-based foams. Rogers PORON® and BISCO® are ideal for battery cell pads because the material offers reliable compression set resistance and stress relaxation performance over a broad range of temperatures and conditions. Additionally, foam pads also isolate and dampen noise and vibration (NVH/BSR) caused by vehicle operation. Maximize performance of batteries and other electronics within the vehicle by shielding against electromagnetic interference. A large electromagnetic field is often produced by the operation of the battery and connecting cables. This can interfere with other electronics within the vehicle. Conductive elastomers, foils, seals and pressure sensitive adhesive components can help properly shield from EMI. Marian manufactures converted parts with copper foils, aluminum foils and conductive PSA. Key EMI/EMC material suppliers include 3M, Polymer Science, and Saint Gobain. EV Charging systems are complex electrical enclosures. Charging stations and plugs are exposed to environmental elements such as rain, snow, ice, wind and an extreme range of temperatures. The enclosures must meet specific industry standards including UL and IP ratings. Additionally, the high electrical current and sophisticated electronics of the system create potential for electromagnetic interference issues. 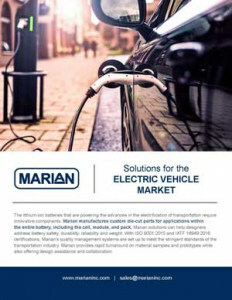 Marian is a leader is manufacturing custom high quality gaskets that will protect sensitive components from moisture, dust and electromagnetic interference for the long life of the EV charging system.